A Charater with may be one or two items. Choose from a wide verity of T-shirt colours in either long or short sleeved and a full range of sizes. On request I may also consider painting on any item of clothing offered. The paints used are Acrylic airbrush paints and can take normal wear and tear, Washing machines and tumble drying (We recommend you turn the shirt inside out. 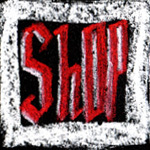 This is in effect a commission for a full, high quality, hand painted character portrait using airbrush with the added bonus that you can wear it. I will first draw a sketch version for you to OK before committing paint to T-shirt. Payment is required in two parts. The first on agreement of the sketch and the second on completion before sending out the finished work. 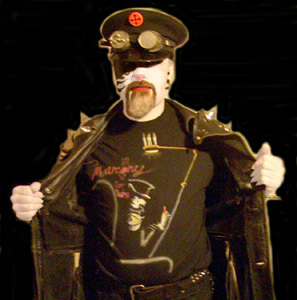 This particular example is one I did for myself to wear when selling my services in person. 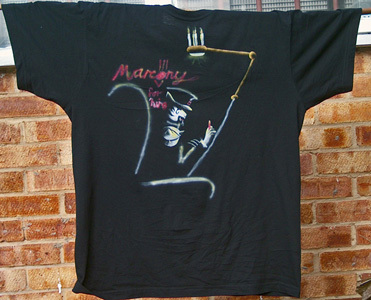 It's on a black short sleaved cotton T-shirt and shows how with airbrush one can easily fill the whole front of the T-shirt. It was painted in 2011. Note: It's unsigned because my name is in big letters on it already. 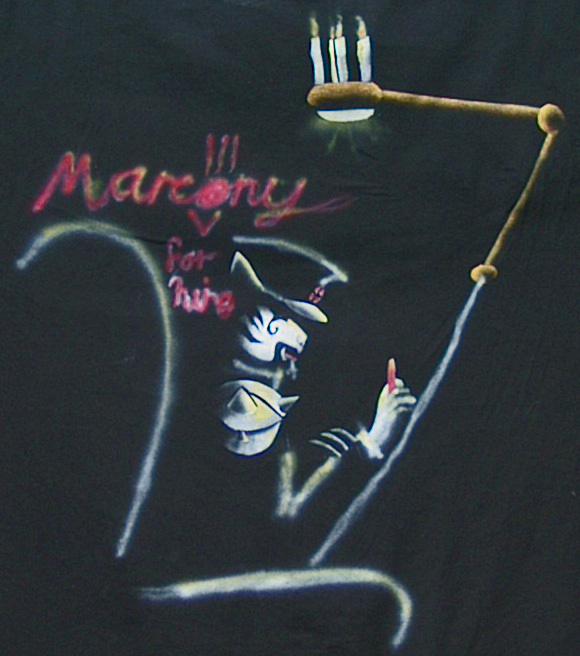 The Character in this picture is (C) Marcony 1997. More examples of Charater Portrait T-shirts can be found in My deviantArt T-shirts Gallery.